I’ve always wanted to see an outdoor game, and the fact that an historic one was to take place two hours away from Montreal should have been an easy choice from the start. Call it fate, call it karma: my box office blunder turned into a positive in the end. We got into Ottawa a little later than planned, and throngs of people in Senators and Habs jerseys were already marching down Bank Street. Parking was already scarce, and we ended up in a lot north of the highway, a good 15 minute walk away from the stadium. We came prepared to face the cold: thermal long underwear, wool socks, hand and toe warmers, scarves and tuques to prepare for the next 3 hours in bitter cold. I foolhardily wanted to rep my Habs jersey, so I had another t-shirt over my thermal undies, a thick sweater, a hoodie and then my jersey. I figured I’d be OK, even though I’d look a bit like the Michelin man. And for a while, I was right. My wife was more conservative and wore her winter coat, foregoing the jersey. Guess which one of us was the smarter? 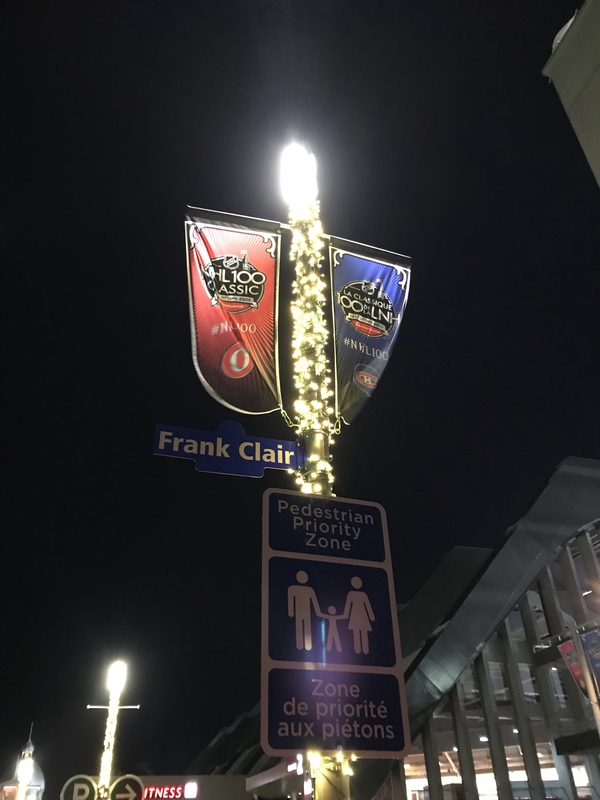 All the Bank Street restaurants were full already so we headed out to TD Place hoping to eat at one of the concessions. I tried to take pictures of the various signage around the stadium but it was so cold that my phone wasn’t cooperating and my hands were screaming bloody murder every time I took them out of my gloves.The Centennial arena was set up by the stadium, but as we were a little too late, we decided to skip the fan area. It turned out to be a good idea. Long lines were snaking in front of the various entrances: clearly we weren’t getting in quickly. As a matter of fact, I saw people complain on Facebook the day after, that the game was started by the time they were let in. Our tickets were sending us to Gate 4, all the way around the back. While at first it didn’t seem like a good thing to walk that far, that entrance was far less crowded. Signage identified the entry point as exclusive to Scotiabank customers, but I’ve never had an account there, so who knows how it was decided. Security was really slow searching everyone but we managed to get in much faster than the people at the other entrances. We headed indoors to find restrooms and food. TD Place is basically two sets of stands built around an indoor football field. The South side is quite recent and features most modern stadium amenities. The North side, where we were, is much older and doesn’t offer much apart from beer stands (surprisingly popular despite the bitter cold) and a handful of concessions with limited food choices. Most stands don’t even have cooking facilities. Pizzas were being hand delivered to each stall constantly. Food was OK, nothing more, but it would sustain us for the evening. One merchandise stand had been set up in a corner, with a limited selection of Centennial merchandise sold at inflated prices. I got an official program that came with a patch and called it a night for shopping. A smaller rink was set up next to the main ice, and players in vintage jerseys had a short simulated game to commemorate that historic first NHL game in 1917. 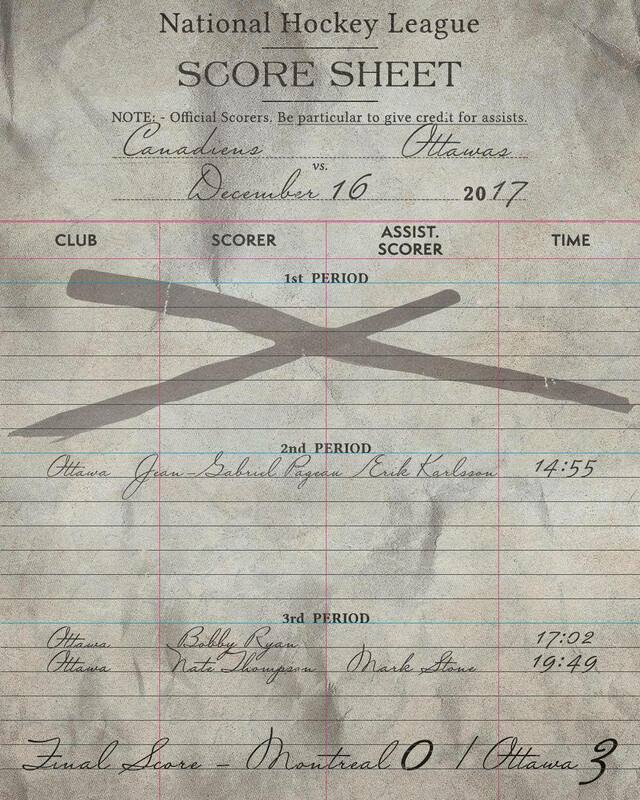 On December 19 1917, four teams of the newly formed National Hockey League played in the league’s first two games, in Ottawa and Montreal. For years, accepted knowledge was that the first of these two happened in Ottawa, hence the decision to host the NHL 100 game there. But recently, historians discovered evidence that the game in Montreal dropped the puck a little earlier in the evening, making that game technically the first ever. 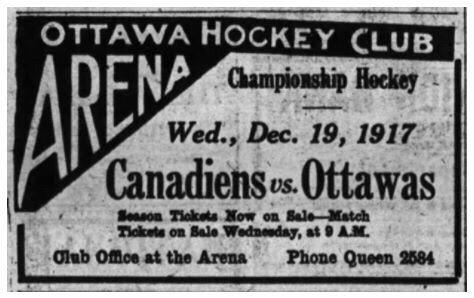 But we’re talking 15 minutes earlier, and since it would be difficult to host a game between the modern day Wanderers and Arenas, a Canadiens/Senators matchup would do just as well. On that year, the NHL was made up of five teams: the Canadiens and the Wanderers (both from Montreal), the Ottawa Senators, the Quebec Bulldogs and the Toronto Arenas. The Bulldogs could only ice their first team in 1919, and the Wanderer’s arena burned down in January 1918, leaving the NHL’s first season to be played with only 3 teams. Toronto won the NHL title, and then went on to defeat the Vancouver Millionaires of the Pacific Coast Hockey Association (PCHA) for the 1918 Stanley Cup (up to 1926, the Stanley Cup was an inter league trophy). 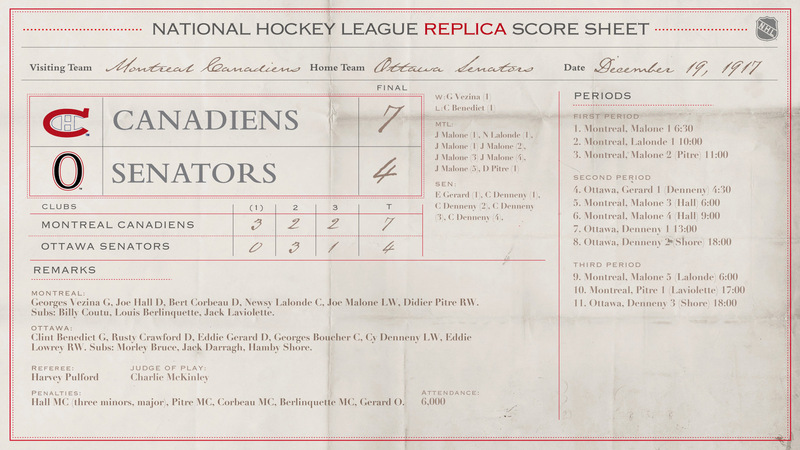 The Canadiens took that historic contest 7-4, with 4 goals from superstar Joe Malone. 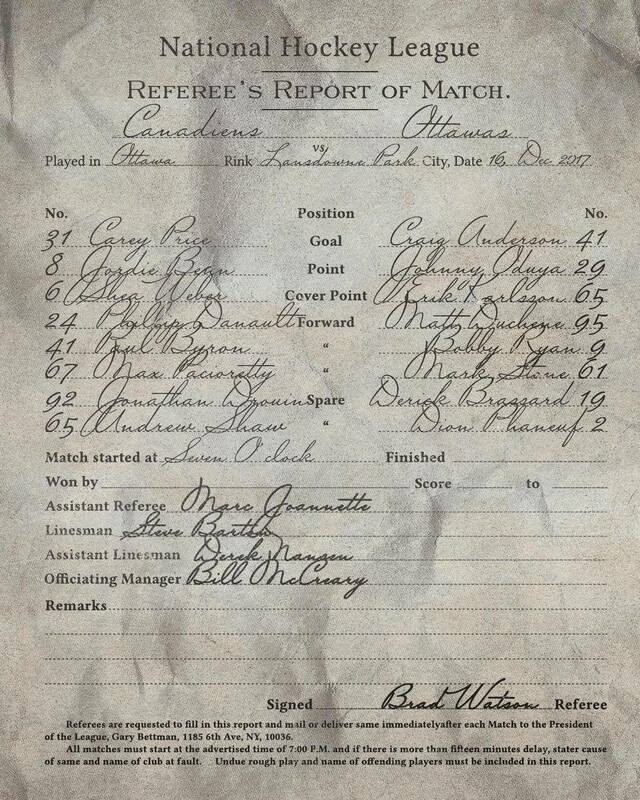 Notable names int he lineups include George Vezina, Newsy Lalonde and Jack Laviolette. Would history hold true for the Montreal team tonight? Into the cold. Oops, I mean stands. Our seats were located close to center ice, but about three quarters up. Watching outdoor game son TV, I always felt that most people probably don’t see the puck, but luckily we were able to follow the game quite well despite the distance. Illuminated lanyards were given to every spectator for the pregame light show, but I noticed ours in the front seat cupholders only after it was over. And my wife’s didn’t even light up! But the show was nice to look at. Serena Ryder sang “Oh Canada”, and Guy Lafleur and Daniel Alfredsson dropped the puck for the ceremonial face off. The crowd, regardless of allegiance, gave Alfie a nice “welcome back to Ottawa” ovation, and Lafleur was greeted with the usual “Guy! Guy! Guy!” chants. And we finally got to the puck drop! Having something to take your mind off the cold certainly helped. We took out the hand warmers, trying to stave off the biting cold. Our section had the benefit of a hanging roof over it, which surely helped cut down some of the wind, but people near the edge must have had a different view of those benefits as throughout the night I saw a big snow pile fall into the stands, and a scarily big icicle followed a little later. Thankfully no one seemed to be hurt. The ice surface seemed to be of decent quality, but the puck was jumpy, breaking up most attempts at fancy plays. You could tell the players were affected by the cold and they kept their play simple, trying to avoid turnovers. As one can expect, this made for a pretty boring first period. The first intermission had a segment dedicated to the best NHL Moment in history, as voted by the fans. Players dressed in Senators jersey, wearing big heads depicting past Canadian Prime mInisters re-enacted caricatures of the top 4 vote getters. And yes, it was a ludicrous as it sounds. The winning moment would be announced during the second period as Mario Lemieux’s 5-way goal game, where he scored an even strength goal, a shorthanded goal, a powerplay goal, an empty netter and on a penalty shot. Lemieux was there to officially receive the honour. The second period saw Ottawa put one up the scoreboard from Jean-Gabriel Pageau, and that was it for the game as play shut down into a defensive affair. Montreal didn’t threaten much, and that goal would end up the winning goal on the score sheet. Second intermission had Canadian superstar Bryan Adams do a 3-song set on a heated stage, playing “Ultimate Love”, “Heaven” and “Cuts Like a Knife”. That put our minds off the cold, and was a welcome shot of energy in an evening short on action. But as the third period started, my wife had enough and she retreated inside to watch the rest of the game on TV. I hung on, hoping for a lucky bounce to bring the Habs back in the game, but it wasn’t meant to be. With 5 minutes left in the game, I just couldn’t stand the cold anymore and joined her in time to see Bobby Ryan put the game out of reach. We exited the stadium, knowing we had a good 10-15 minute walk back to the car. As we walked away, we heard the crowd cheer the third Senator goal of the night, an empty netter by Nate Thompson. I’ve always wanted to attend an outdoor game, and I couldn’t have asked for a better one than a celebration of the NHL’s first century. Did I enjoy the game? No. Both teams are struggling this year, and played safe hockey which made for a boring spectacle. And watching a game in -20C weather isn’t much fun, no matter how dressed up you are. But I was there, and I can tick that off my list. But next outdoor game? I’ll watch from my living room. 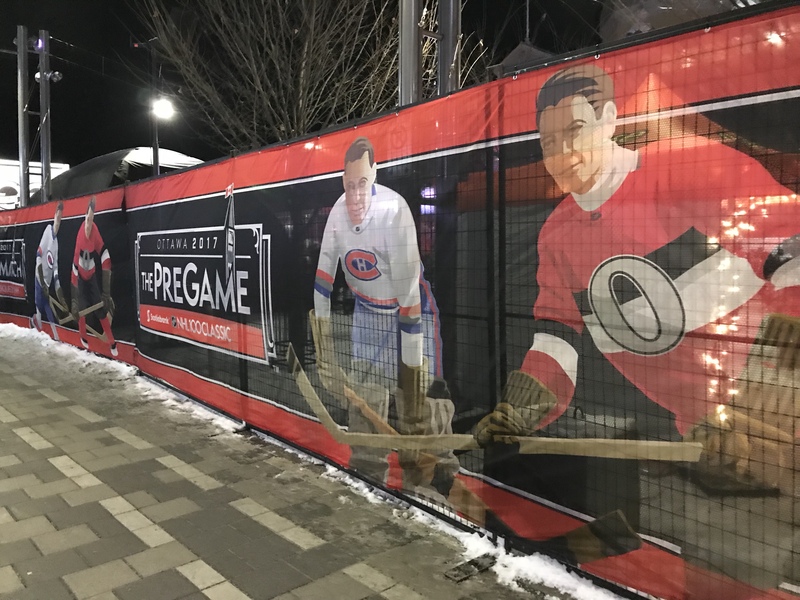 This entry was posted in Games, Travel and tagged Canadiens, Historic, NHL 100, Outdoor, Senators by Jean-Frederic Vachon. Bookmark the permalink.